"Attorney Lavi Soloway, who has been litigating several of these cases and co-founded Immigration Equality, went further, telling Metro Weekly, "I am grateful to Senator Kerry and all twelve Senators for their aggressive response today. 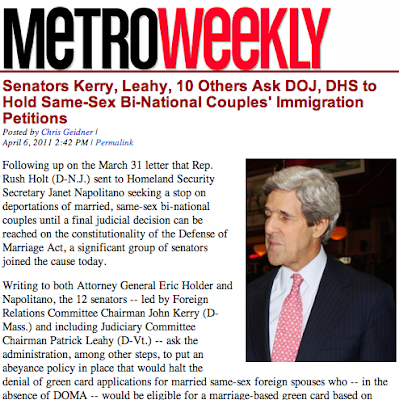 Gay and lesbian binational couples need executive branch action now. We must stop this government from tearing apart these families." Soloway -- who started the "Stop the Deportations" project in 2010 -- continued, "It is vitally important that DOMA related deportation proceedings be terminated or adjourned, that a moratorium on removal orders be instituted and that no petitions or applications for permanent resident status filed by married gay and lesbian couples be denied because of this unconstitutional law. The Department of Homeland Security and the Department of Justice must move swiftly to develop policy in response to this letter to prevent imminent deportation in numerous pending cases."